Thanks for the feed back starlit that sounds wonderful I can't wait to test your next release. I'll try to provide any healthy suggestions or helpful advice if I believe it may provide you with more additional help. :) I really did enjoy it hope you keep up the great work. It won't seem to be able to launch the game. Does it just open up a black window, or nothing at all? Do you see any error messages? Of course you can LP the game, thanks for asking though :) Feel free to share the link! I'll definitely watch it. Was this created with RPGMaker series or Visual Studio? Has some nice graphic effects. Interesting! 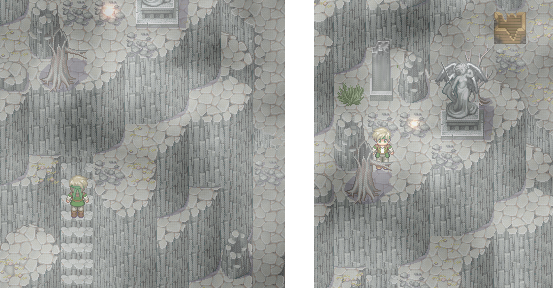 Didn't know RPGMaker was capable of such effects. Was it the VX:Ace edition or the most recent one? The demo was with Rpg Maker XP(!) But I'm working with the latest one for the upcoming release. I'm working on the full game, currently there's only the demo, sorry! Aww thank you so much for taking the time to write this! c: It makes me happy to hear that you enjoyed the game so much. I'm working hard to make sure the rest of the game will get even better than the first chapter. Its a real catching story, i needed to leave tear for the death of Aura on the beginning. Here, have a virtual hug c: Happy to hear you connected to the story! Have you been back to the village yet? As everyone has already said, this is so well done! I had to stop playing for now because I have other stuff to deal with so the ability to save any time is also a major bonus. If I had to suggest something though, it would be to add a built in brightness option in-game. Because my screen is already at the max brightness and I still can't see the logo that's supposed to be barely visible. I really like how the context and the things that happen during the story kinda make you feel like you're trapped. The whole "we're pursued by this powerful group and aren't really safe anywhere" + the different scenes when you are actually trapped (in the forest with Aziel and his troops, when you meet the Rebels near the shrine, when you fall into Aziel's trap...) and feel like you can't escape (because you're literally surrounded by enemies), it was really great. Another thing that left a strong eimpression on me was everything that happened with Aura. I have sisters, of course I relate. And the fact that you aren't even able to bring back her body is really a hard blow, good job on that. I felt really bad for the whole first part of the game. And the very last part of the demo, when you finally understand how the first thing is linked to the rest, but that only brings more questions... (+ Aura coming back to stab my poor heart) It was great as well, it really hit me. Sorry, my comment is kind of a mess, I've just finished the demo (its was a really long demo, that surprised me) and I'm still thinking about it (and english isn't my first language). But really, it was great, and I'm definitely going to buy and play the whole game when it comes out! Thank you for this really cool game and keep up the good work! Wow, don't worry about your comment being a mess, I just read it and it totally made my day :D I'm happy the game and it's characters connected in that way to you - I also have a sister and I totally get were that emotional response comes from, so it's always interesting to hear how these things resonate with different players. I absolutely loved your game. The story is very interesting and it's very cool how I can talk to my own character. I do have a few tips and glitches found. First of all with the train rail puzzle there is a cave with a chest, you can open the chest and get an item but the name of the item is a code and it shows a blank in your item screen. There was also some German text at the Prosophina (Is that how you write her name?) church her altar. after you talked to masame and then went into the church. There are a lot of times where you just have to wait for nothing. Like the screen stands still to build up tension probably but that takes to long and actually has the oppisite effect. I also didn't get to know Raphael and Sarah that much even though their characters were very interesting. And an explanation on who Haily is would've been nice as well. Very good game overall and I'd give it a 8/10. I hope more will come soon. Is there anyway I can get a notification for new content? P.s. Sorry for my grammer English isn't my first language. Thank you so much for your detailed feedback on how you liked the story! I'll try to fix the glitches & missing translations ASAP :) A few people have mentioned the waiting times in certain scenes. In some occasions the game actually loads stuff in the background, but these few spots will get better in the next release. okay I will. Guess I'll be anxiously waiting now. Keep up the good work. One of the few games that made me look forward to playing it again. PS: I tried to make this review objective, but I LOOOOOOOOOOOOOOOOOOVED this GAME!!!!!!!! Looking forward to new releases!!! Hey there! Thank you so much for your honest feedback, I really do appreciate it :) I think about the characters and how to present them and their motivations a lot. I guess it's one of the hardest things to master in storytelling to create believable characters. Raphael's struggle shifts way more into focus in the upcoming 2nd chapter but I've already implemented some revised parts for the earlier sections of the game (not released yet) to make the whole quest feel more urgent. Again thank you so much for sharing your thoughts! I hope you stick around for the next chapter! Hey ilow! Thank you so much for the nice and motivating words, this made my morning a 1000 times more enjoyable today :D I'll give my best to deilver a great game to all of you! Hey starlit! It's me, ThatBoyHM! I sadly have to say that i deleted the channel along with all my Numina videos. I'm now known as "HoussemPlayingGames" and i don't think i'll be coming back to this game sadly. Hope you understand and good luck with the game! Amazing! I have recorded 4 parts and cant wait to get the next part! The music is beautiful, the story is to captivating and the begining pulld on my heart strings! Combat is interesting for turn-base. 10/10 game so far to me. You're very much welcome, and yes im Agent J. I honestly cant wait when this game is released. Ive posted my recording on your game on Facebook, as well as Tuber's Amino and will be glad to see that you guys will be chacking outmy video! Hope you enjoy it, even though its got no commentary. Sadly not, I'm sorry :D It'll take a few more months at least. But I'll soon release a big news update on the game's progress. How to get the game started? I clicked on the launcher app but nothing happened. Hey there! I need a bit more information to help you: Does a black window pop up? Or do you see nothing at all? What OS are you running? Nothing at all. I'm using windows 10. What happens if you open the bin-directory and then execute the Game.exe inside of it? I did it already, and nothing happened. This is weird. I tried to run it with administration and without antivirus app, still hopeless. Open the game's folder. Navigate to "bin/Fonts", right-click on the "Formal436 BT.ttf"-Fontfile and select "Install". This should install the game's font on your system. Then go up one directory to "bin" and start the Game.exe in that directory again. The story is addicting (makes you crave for more! ), the art is beautiful (I especially like the part on that windy hills(?) where they first met cassandra and masame). I like the combat system too . There are a few bugs here and there, but that to be expected (it's still in development, after all). Do you have at least an estimation when the full version will be released? Not really at the moment. I'm working full force on it, but I have still a lot of work ahead of me. But please stay around for future updates on the game's progress :) Thanks again! This game is incredible. i spent a day playing the demo. I am really looking forward for the full version. The graphic of the game is well-elaborated and the story line is intriguing. One thing I found as a problem is that whenever I am facing the wild beasts, if i want to escape I can't, rather the game clashes and shuts down. Thank you so much for your feedback :) I'm glad you enjoyed the game! And sorry about the apparent bug with escaping, I'll look into it as soon as possible. Hey there's a bug in the demo when Shawn and Raphael are trying to get up the path with the grappling hook- The mountain goats (I think?) should be moving at random and you can move past them but one is standing still and blocking the way. If this isn't a glitch and I'm just being stupid then please let me know! This game looks fantastic so far! That would be amazing! Please send your compilation to contact@starlit-studio.com :) Thank you! This is one of the best free games i've played so far. Keep up the good work man, excited for the full release! And thank you so much for playing it! :) Happy you enjoyed it! I'm having issues running the game, everytime I open it the game freezes. Okay, I need a bit more information to help you: Does a black window pop up? Or do you see nothing at all? What OS are you running? a black window pops up and it says it is not responding, I am running windows 10. Okay, we can try a few things. Then go up one directory to "bin" and start the Game.exe in that directory. If that works you'll propably have to always start the game through the bin/Game.exe. I'm very sorry for the inconvenience and I hope this solves your problem! Hey there! Thanks so much for your enthusiasm & interest in the game! 😊 I'm working hard on the release of the next chapter. I guess it'll be around next year. Hi, I just downloaded the game but the grappling hook doesn't seem to be working? I can see the exclamation mark which I believe indicates that I can call an action? However, when I press Enter, it does nothing. Can you tell me the location/place in the game where this happens? I'll look into it. Sorry for the inconvenience! I'll make it a bit more clearer where to stand. But for now, please use the above screenshot as a reference. And once again, sorry for the inconvenience!